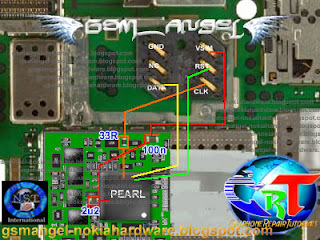 Insert SIM card problem on Nokia X3 usually caused by the hardware failure. In this post, mobile repair guide provide a picture related to Nokia X3 insert SIM card problem, this is a jumper guide, so you don't need the schematic diagram anymore. In the picture, you can see there are four colors line. Check them one by one whether the connection is good? If no, make a jumper. If the connection that shown by the picture above in good condition, it possible the problem occur to the SIM card driver. Try to re-heat using a blower or replace if possible.